28th August, 2011, Bhopal, M.P. Well ! Today the is a great a day for us as from celebrating IT Diwas at Bhopal, we have now moved to Grand Heritage City of Indore. The enthusiasm shown by the Channels in state of Madhya Pradesh has made our will stronger to make the IT Diwas, a celebrative and a repetitive affair. Next year in 2012 we will include Chhattisgarh and make it a bigger & better event, such a event conceived for the first time in the entire Madhya Bharat. SD's No.1 Computer Vendor and Reseller of the Year 2011 in Madhya Pradesh. SD's No.2 Computer Vendor and Reseller of the Year 2011 in Madhya Pradesh. SD's No.3 Computer Vendor and Reseller of the Year 2011 in Madhya Pradesh. to Shri Sharad Agrawal of Pioneer Computers. SD's No.4 Computer Vendor and Reseller of the Year 2011 in Madhya Pradesh. SD's No.6 Computer Vendor and Reseller of the Year 2011 in Madhya Pradesh. 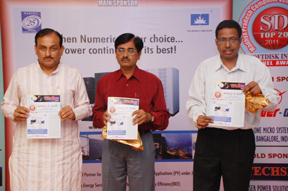 SD's No.8 Computer Vendor and Reseller of the Year 2011 in Madhya Pradesh. to Shri Vimal Jain of Supreme Infotech. SD's No.10 Computer Vendor and Reseller of the Year 2011 in Madhya Pradesh. to Shri Ajay Rochlani of Supreme Infotech. SD's No.12 Computer Vendor and Reseller of the Year 2011 in Madhya Pradesh. to Shri Rajesh Bohara of Skyline Systems. SD's No.14 Computer Vendor and Reseller of the Year 2011 in Madhya Pradesh. to Shri Sanjeev Gupta of Veltronics India Pvt. Ltd.
SD's No.18 Computer Vendor and Reseller of the Year 2011 in Madhya Pradesh. to Shri Ashish Saxena of Advanced Technology Computers. SD's No. 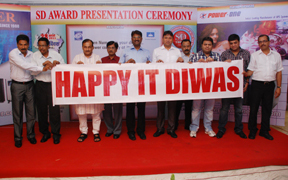 20 Computer Vendor and Reseller of the Year 2011 in Madhya Pradesh. to Shri Akilesh Shah of Jai Jainedra Computers. SD's No.1 UPS Vendor of the Year 2011 in Madhya Pradesh. to Shri Mahesh Punase of Weartech Engineers. SD's No.2 UPS Vendor of the Year 2011 in Madhya Pradesh. to Shri & his team R S Power Solutions, Indore. Zoom View SD's No.3 UPS Vendor of the Year 2011 in Madhya Pradesh.